Oops - we don't appear to have a video for the DocuMate 262i. The DocuMate 262i is designed for desktop use in any office where scanning plastic cards (such as driving licences), business cards, documents or other heavy card stock is necessary. It incorporates a new, patent-pending front-feed tray that not only increases card scanning efficiency but also reduces roller wear by up to 60 percent over competing brands, resulting in lower total cost of ownership. The DocuMate 262i also includes ultrasonic double-feed detection technology that will alert the user if double feeding of originals occurs during scanning. This technology prevents lost images and enables paper of different weights or thickness to be scanned quickly and reliably. The DocuMate 262i is powered by Visioneer OneTouch® scanning technology for eliminating multiple steps in sending scanned documents in all popular file formats, including searchable PDF, to predetermined applications such as Microsoft SharePoint, DocuWare and/or to devices such as printers and storage systems in just one touch. While some competing products also have scan buttons, they still require multiple clicks to complete the job. The DocuMate 262i scanner also includes Kofax® VirtualReScan (VRS) version 4.2 software, which provides unsurpassed image quality, superior optical character recognition accuracy, autoexposure, auto-cropping and wide-angle deskew. The DocuMate 262i processes scans at 38 ppm / 76 ipm at 200 dpi monochrome and grayscale. 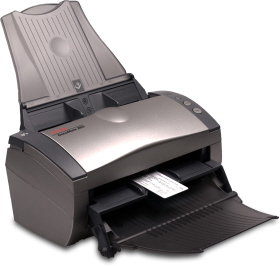 The scanner also has one of the smallest footprints of any automatic document feed scanner on the market. It offers an optical resolution of 600 dpi, 24-bit internal colour, a hi-speed USB 2.0 interface (USB 1.1 compatible). Bundled software includes TWAIN and ISIS® certified drivers, Kofax VRS, Nuance® PaperPort®, Nuance OmniPage® Pro, and EMC Captiva® QuickScan Demo. The convenient 50-page capacity ADF can handle paper and photos from business card size up to A4.